The perfect winter landscape can be yours. With fall right around the corner, you might be wondering how your landscaping is going to hold up once the temperature starts to drop. There are a lot of plants and landscaping features that simply won’t survive the cold weather, but don’t worry! You can redesign your landscape for winter with features that will look amazing year round. Are you ready to learn more about how you can redesign your landscape for winter? Well, let’s get going. Use trees and bushes to your advantage. Now, little flowers might not like the cold weather, but trees and certain bushes will look great. Though the trees will lose their leaves, they will be one of the major focusses of your landscaping design. When it snows, their dark bark will provide start contrast. You might want to think about adding in some holly bushes as well. 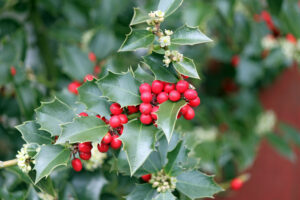 Not only will they bring out a Christmas feel, but they will also add a little splash of color to your landscape. Let hardscaping take the spotlight. Hardscaping features like your patio, retaining wall, or even a stone pathway are going to be lovely when winter hits. If you were thinking of adding one of these to your design, then this would be a great time to do it. After all, you have many options when it comes to hardscaping materials, so take advantage of it. Even a water feature can add a lot of pop to your landscape, though it will be frozen or out of commission. The stone itself can still add a lot of class to your yard and you’ll be ready for the spring. Need professional landscapers to help you achieve your new landscape for winter? We can help! This entry was posted on Monday, August 24th, 2015	at 2:04 am	and is filed under Blog, Landscaping Design	. You can follow any responses to this entry through the RSS 2.0	feed. Both comments and pings are currently closed.